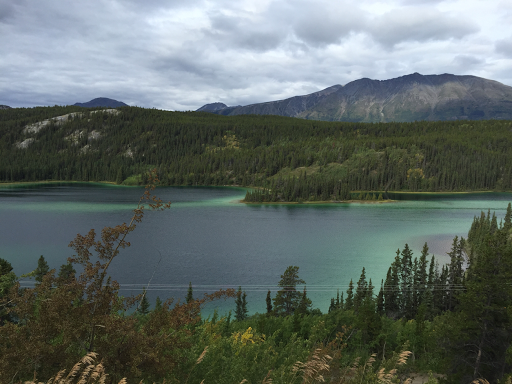 Seeking True North, Day 4: Whitehorse, YT and Skagway, AK. 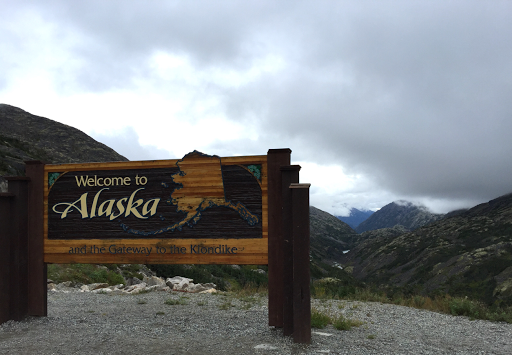 Though this trip is all about seeing the Canadian territories, we decided to make a side trip today and drive down the Klondike Highway to Skagway, Alaska. Approximating the route that Klondike Gold Rush prospectors followed in their search for riches, the 442-mile highway links Skagway on the Alaska coast to Whitehorse and continues north to Dawson City, Yukon. Before the road was completed in 1978, Skagway's only connection inland and to the lower 48 states was by rail to Whitehorse. The 98-mile Whitehorse-Skagway portion of the two-lane asphalt road, usually referred to as the South Klondike Highway, was built to accommodate tourist traffic and was originally closed during winter. 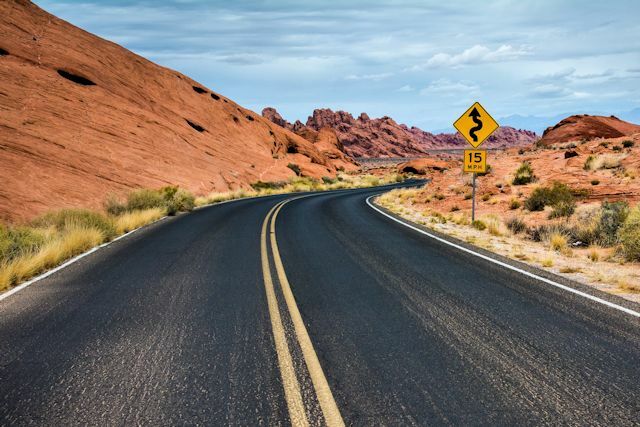 Since 1986, the road has been open year-round, a reflection of its vital status as a route for commercial transportation. Between Whitehorse and Skagway, the well-maintained road traverses a wild and natural corridor, passing through some of the most spectacular scenery we have traveled. The picturesque village of Carcross, YT (pop. 289) offers the only sign of human habitation along the route. 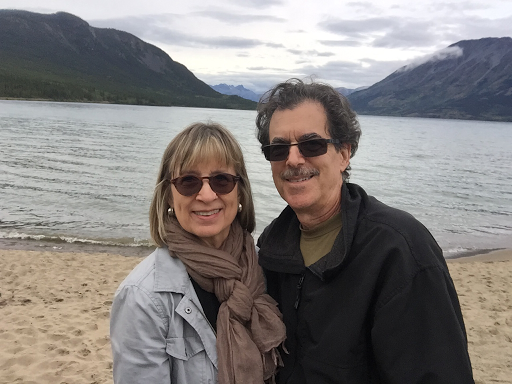 Carcross and Skagway (pop. 920) both benefitted richly from the Klondike Gold Rush in the 1890s. Would-be miners, mostly from the U.S., who quit their jobs and fled north in search of riches arrived in Skagway by boat. There they bought the supplies and equipment they would need for the grueling 500-mile journey to the gold fields near Dawson, where enormous quantities of the precious mineral had been reported. 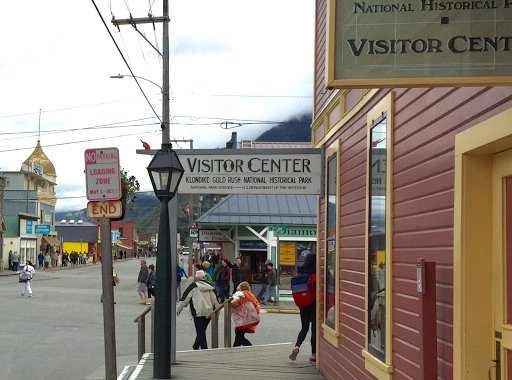 Skagway grew quickly with thousands of prospectors flooding to join the fray. Within a few weeks after the first arrivals, dozens of stores, saloons and offices filled the muddy streets. 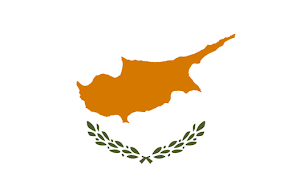 The population grew from a few dozen to more than 8,000 within a year. Within three years, gold was discovered in the area of Nome, and the stampede of prospectors shifted northward. With the life squeezed out of its economy, Skagway's population collapsed. It would likely have become a ghost town without the construction of the White Pass and Yukon Route Railroad, which supplied freight, fuel and transportation to Whitehorse and other communities inland. The railroad and related services provided enough employment to keep the town afloat until the next boom came along in the form of cruise ships. Capitalizing on its brief history as a gold rush town, Skagway created a colorful historic downtown with storefronts typical of the late 19th century. Saloons and gem stores, restaurants and gift shops line the wooden sidewalks and draw tourists in like flies to honey. And they arrive in droves. The tiny town's port has dockage to host numerous large cruise ships simultaneously, bringing in 800,000 of this new type of stampeder from May to September each year. As we strolled the boardwalks today, we couldn't help noticing that the cruisers filling the town seemed to be enjoying themselves immensely, and most were toting bags with purchases made in town. Of course, local merchants were equally happy as their coffers were rapidly filling, facilitating their need to earn a year's income in five months. 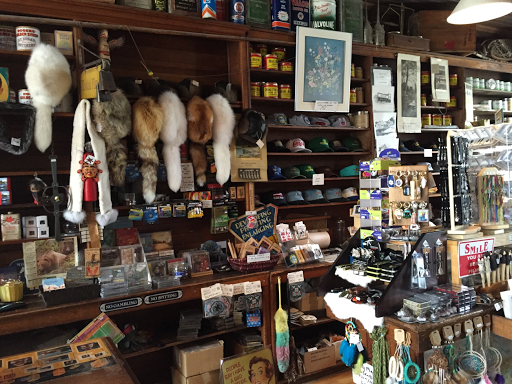 Carcross retail market reflects its native origins. On our stop in Carcross, we learned that coastal towns aren't the only ones who benefit from cruise-goers' spending. Once a thriving resupply and resting station for gold rush stampeders who survived the arduous journey through White Pass, Carcross also dwindled after the fortune seekers went elsewhere. With a station on the railroad line, the town hung on until it also became a darling of the tourist industry. After the Klondike Highway opened, the railroad shut down to commercial traffic but soon opened as a tourist attraction, offering day trips to cruise passengers. Now flocks of visitors ride the train from Skagway to Carcross and return to the port by bus. 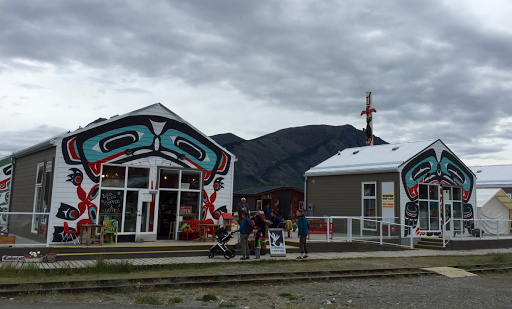 In response, Carcross has developed its own retail magnet to attract tourist dollars. Most businesses are open only during the summer season. Owners and their employees put in long hours to earn enough to last through the winter, which some spend in another location such as Vancouver. Though we found the histories of these resourceful towns quite interesting, the star of our day was the scenery from Carcross to Skagway. 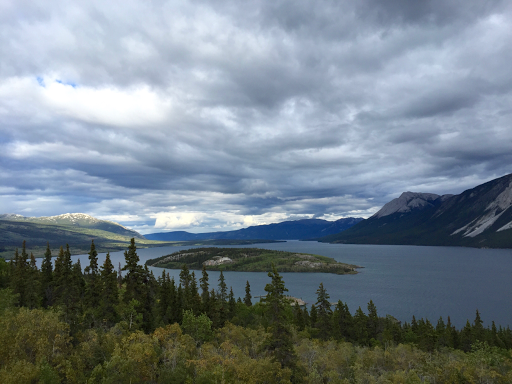 Just before Carcross, we stopped at a scenic overlook on a hill above Emerald Lake, one of the Yukon's most photographed vistas. In fact, this view adorns the front cover of this year's official Yukon highway map. The sandy bottom of the shallow lake lends it a unique greenish hue. Before leaving, we planted one of our "Love This Spot" letterboxes. 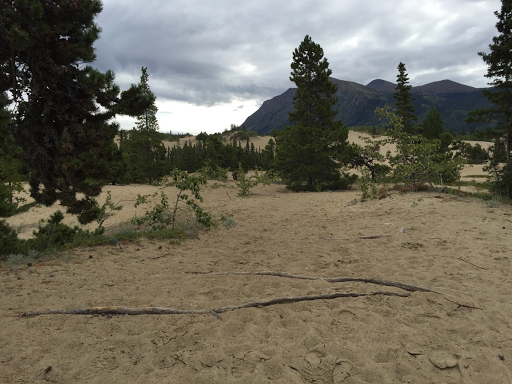 On the northern border of town, we stumbled upon what is humorously called the Carcross Desert. An isolated group of sand dunes formed by windblow from nearby Bennett Lake, the 640 acres are a botanist's haven, nurturing plants found nowhere else. 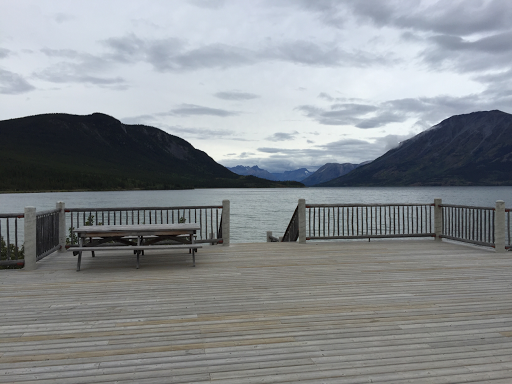 Thanks, Carcross, for this beautiful picnic spot. At Carcross, the road enters the Southern Lakes region, a series of massive glacier-fed mountain lakes that supply the headwaters of the mighty Yukon River. Carcross sits at the confluence of Lake Bennett and Nares Lake. Wandering through the town, we chanced upon a municipal picnic spot with a stunning view of Lake Bennett and Montana Mountain beyond. 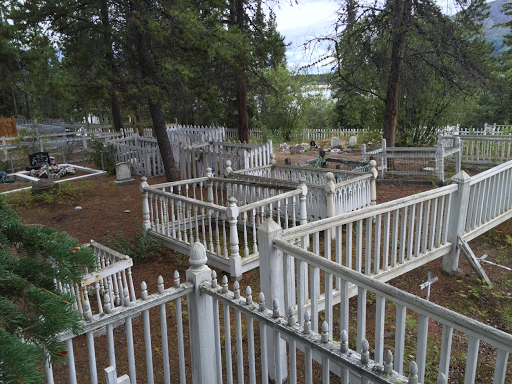 Most of the enclosures in the Carcross Cemetery hold just one grave. Another stop in Carcross was at the local cemetery. 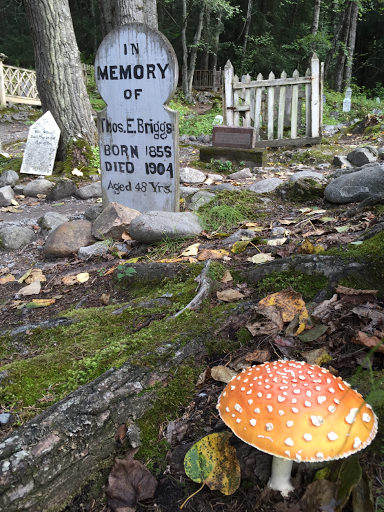 Unlike Skagway's Gold Miners Cemetery, which is promoted as a tourist destination, the Carcross burial ground is hidden away on a gravel road running under the Klondike Highway bridge. Our mission there was to find the final resting place of local residents whose discovery of shiny objects along the shore of Bonanza Creek in northern Yukon led to the Klondike Gold Rush. The cemetery was nestled inside a white picket fence, and most graves had their own enclosure, also painted white. The effect was like a field of baby cribs scattered about. We found the markers for Skookum Jim Mason, Kate Carmacks, and Dawson Charlie and paid our respects by leaving a letterbox to encourage others to visit the site where these Yukon history makers are entombed. From Carcross the beauty of the scenery intensified with one amazing view after another. Just when you thought you had seen the best the Klondike had to offer, you would round a curve and find a scene of equal caliber. 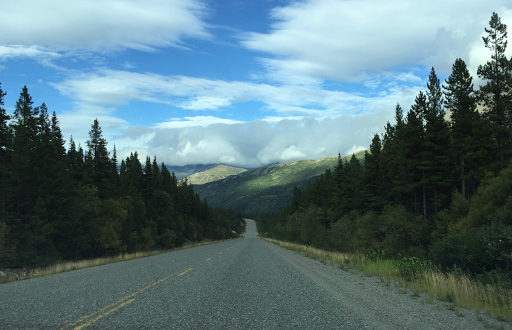 We have driven numerous roads which have been lauded as being among the "most scenic drives" on the continent that don't even approach what we found on the South Klondike. Yet we don't ever remember seeing it listed. A customs agent at the U.S. border tried to persuade us to return to Whitehorse through Haines so we wouldn't be repeating the same route on the way back. 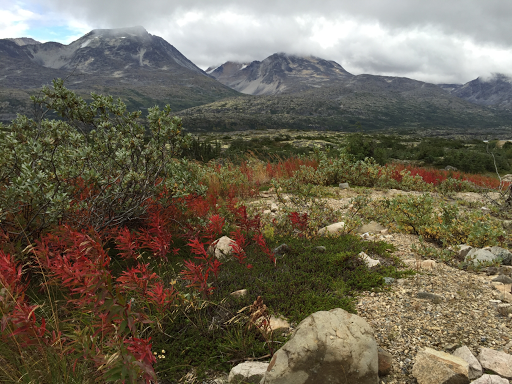 No doubt that route has much to offer, but we were more than happy to see the wonders of the South Klondike again. Tomorrow is our last full day in Whitehorse. We plan to relax a bit, maybe see a few sights we've missed closer to town, and get ready for our trip to Yellowknife in the Northwest Territories on Sunday. Look at the Size of that Skeeter! The diamond shaped yellow road signs we obliviously depend on in the U.S. to warn us of upcoming road changes were absent on the Canadian section of the Klondike. 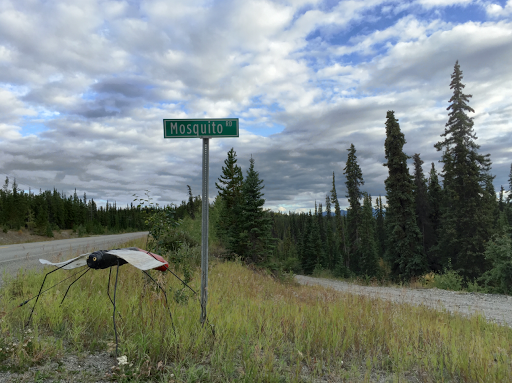 With no official notice of coming intersections, some creative soul near Mount Lorne installed an oversized metallic mosquito sculpture at the roadside to alert drivers they were passing Mosquito Road. 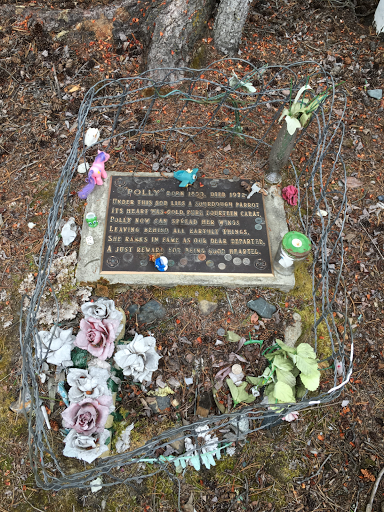 Polly, the Foul-Mouthed Parrot: The most adorned grave we saw in the Carcross Cemetery was that of Polly the Parrot. According to legend, this long-time resident of the town's Caribou Hotel loved to bite, drink, sing, spit and swear. Reportedly living to the age of 125, Polly learned her tricks from the rowdy miners who frequented the hotel. When the old bird finally died in 1972, the entire town turned out for her funeral, along with others who traveled from Whitehorse. At its conclusion, the entire funeral party gathered at the hotel to raise a drink to the town's most famous resident. Looks as if people were kind to Polly in the end, even if she wasn't to them.